"What are you talking about? I do not have three tails!" 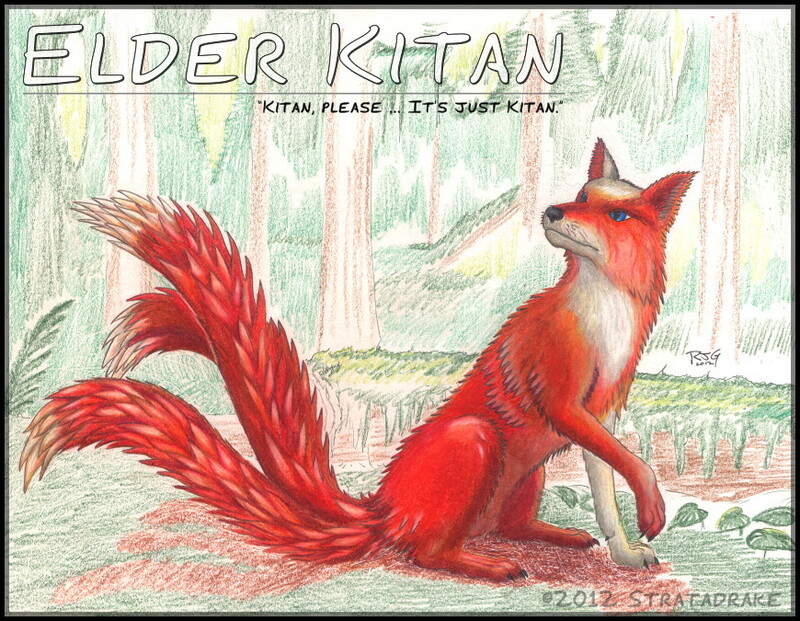 Anyway, this is Kitan as he appears in my 2011 Nanowrimo novel. He doesn't particularly like being called an Elder, and he absolutely refuses to let anyone talk about his tail(s) in front of him. But he still has the best nose of any character in the setting, quick feet to keep him alive, and is second in authority only to Rava. SUper detailed fox and all of a sudden- not as detailed background! What is the name of this Nanowrimo novel? Backdrop is vague and unfocused deliberately, mainly because it wasn't planned from the start - I didn't want to leave the paper blank, but I didn't want it to be 'busy' or distract from Kitan either. I like how you did the background, not detailed to draw attention, but just a suggestion of context and as you say, not leaving it blank. Yay Nano. I love Nano. this sounds and looks like an interesting character. do you do Nano every year? do you ever intend to perfect and publish your nano creations? you started when I did but you have been much more diligent. that's cool. Every one of them managed to hit 50,000 words in the month and be validated (officially a winner) ... but the 2009 one I personally consider a failure. Oh! YOU wrote the novel! Well, it is high time we get to read about these! Upload now!